This camera will fail because it’s simply too little too late. 4K/30 for $10500 in 2018 isn’t gonna cut it. ZCAM V1 is 6K/60 and only costs $8880. Also Insta 360 Pro is around 3K$ and does 8K stereo or 4K @ 120 fps, being smaller and lighter. I don’t know how they hope to sell this thing…. 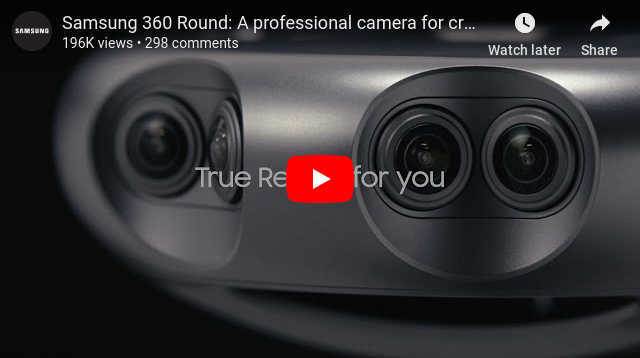 It has at least one feature you don’t find on most 360 cameras: the lenses look to be protected. They’re inset, so dropping the camera and letting it roll around probably won’t cause the glass lenses to be touched. Still, I imagine it’s not recommended to drop or kick like a soccer ball (though the thought of seeing a 360 video AS the soccer ball suddenly sounds so cool). good point. also check out panono and vuze. their lenses are also inset.